In a decade spanning the 1960s and 1970s three major crises gripped the world of cricket. The Close Affair in 1967, when Brian Close was relieved of the England captaincy in controversial circumstances, laid bare the ugly class prejudice which had lingered on from the days of Gentlemen and Players. The d'Oliveria Affair saw the selection of an England touring party become a major international incident which divided the nation. And the birth of World Series cricket forced players and establishment alike to confront the very nature of the game, and how it should be played. Torn between the politics of the sport and the shifting social pressures of the day, the venerable institution of cricket found itself caught at a crossroads that would come to define how the game would be played and received for years to come. 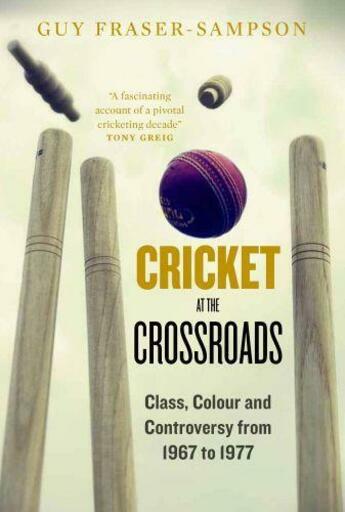 Based on original research and interviews with key figures of the day, Guy Fraser-Sampson evokes the era of the 1960s and 70s, the attitudes and politics of the time, and tells for the first time the story of the decade that dragged cricket forever into the modern era. Along the way, the book tells the story of some of the cricketing greats, and of their triumphs, disasters, and personal tragedies. Gary Sobers, Colin Cowdrey, Ted Dexter, Ray Illingworth, John Snow, Derek Underwood, Geoff Boycott. The ups, the downs, and the elusive what-ifs.